Working the midnight shift late last year, American Airlines dispatcher Joe Arena monitored planes flying from Dallas to Peru, and noticed that some burned far more fuel than others. Arena, whose mania about engine performance may owe to his hobby following top-fuel drag racers, compiled a list of gas-guzzling jets and gave it to superiors. Officials at American, the largest U.S. carrier, believe they can save $11.2 million a year by fixing the worst offenders in the 726-plane fleet - sometimes with mechanical adjustments, other times by smoothing out small dings that affect a plane's aerodynamics - as part of a larger plan to save $118 million in fuel a year. That might seem a pittance to an airline that has lost more than $6.7 billion since 2001, but company officials say they must start somewhere. Jet fuel accounts for nearly 20 percent of American's costs, its second-largest expense behind labor. American spent $2.8 billion on fuel last year, and with stubbornly high oil prices, it estimates the 2004 cost will be $3.4 billion. The increased cost of fuel turned what could have been parent AMR Corp.'s first profitable year since 2000 into another money-loser. It's the same story at many other carriers. Their trade group, the Air Transport Association, estimates that U.S. carriers will pay $6 billion more for fuel this year because of higher prices. Eighteen executives, including the CEO of American, asked Congress last month for relief from fuel costs. But Congress - which approved $5 billion in grants for the industry after the 2001 terror attacks - hasn't responded this time. The average price of a gallon of jet fuel on spot markets along the Gulf Coast is $1.39, nearly twice the price of a year ago. 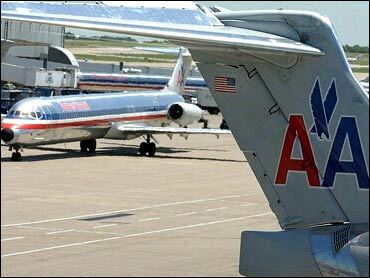 American cited fuel when it tried to raise fares last week, but the move stalled when some rivals declined to boost prices. Among the fuel-saving steps American has taken: taxiing on one engine instead of two, and shutting down auxiliary gas-powered engines while planes are parked at the terminal. To reduce weight and improve mileage, American jets have been carrying half as much reserve fuel on international routes since May after the Federal Aviation Administration approved. American also uses its planes as tankers, ferrying fuel from places where it is cheap instead of filling up where it is costly. This summer, when jet fuel cost $1.58 a gallon in California but $1.16 in Dallas, American saved $400 a flight by filling up in Texas. Steve Chealander, a pilot picked to lead American's fuel program, said ferrying will save $15 million this year. Computers are used to calculate how to spread the weight of passengers when flights aren't full - an uneven load could cause the nose to rise, increasing drag and reducing mileage. Changing the center of gravity on each MD80 and Boeing 757 by just 11 inches will save $5 million a year, Chealander said. "You're not going to find a $100 million saver, but you can find lots of smaller ones that add up," Arena said. American is also considering imitating Ted, the sister carrier to UAL Corp.'s United Airlines, which has reduced the maximum cruise speed of its jets to conserve fuel. AMR also is studying whether to install "winglets" on its planes, like Dallas-based Southwest Airlines. Southwest began installing the upturned wing tips on its Boeing 737-700s late last year and reports that they boost mileage 3 percent to 4 percent, saving about $9 million this year. However, the winglets cost $725,000 a pair, so it could take Southwest several years to recoup its investment. Still, Southwest Treasurer Tammy Romo said the real improvement in fuel efficiency will only come as carriers add newer, more efficient planes to their fleets. Southwest's most successful effort to cut costs hasn't saved a drop of fuel, however. It's a financial tactic called hedging - taking an option to buy fuel in the future at a certain price. Southwest has been the most aggressive hedger in the industry, locking in 80 percent of its fuel buys for this year and next at prices more than one-third below current levels. Romo said Southwest will save more than $300 million this year by hedging. American wasn't able to hedge because it was near bankruptcy last year. Fuel is so expensive now that hedging would backfire if prices fall. Chealander said American will continue the conservation measures even if fuel prices drop. "We're going to heal the wound, then we're going to be doing this regardless of fuel prices," he said. "We should have been doing this years ago."